Found growing in southern Virginia, North and South Carolina, Georgia, Alabama, Northern Florida, Louisiana, Mississippi, and a bit of Eastern Texas, this lily has a rather large range. 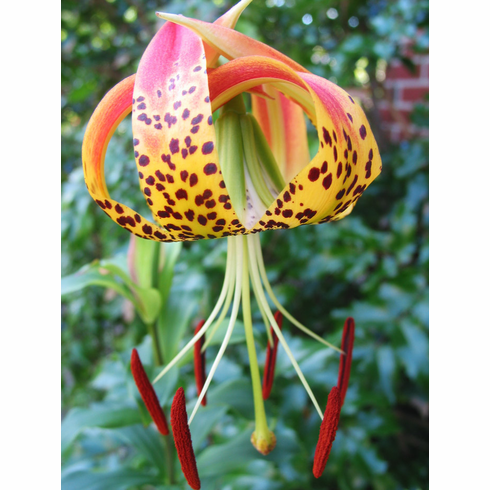 Known as �The Carolina Lily�, L michauxii likes a well drained, dryer ground. It has proven difficult to keep in our Pacific Northwest climate. Unusual for a species in that it is a stem rooter and insists on a lime-free growing medium. It has a stoloniferous bulb and stems usually top out at about 3 feet. Friends in the deep south say �it is a weed� but L michauxii often proves to be a challenge when grown out of its native area. Title photo as well as inserts 1-3 all courtesy of Charlie Kroell. Copyright Charlie Kroell, all rights reserved. Used with permission. Charlie reported that growing in a pot, this plant reached a height of about 18 inches and in the 2004 - 2005 growing seasons only produced a single flower that had a wonderful fragrance when brought into his family room where the fragrance could be enjoyed "from wall to wall". Insert #3 shows off a distinguishing feature of L. michauxii which is the creamy white throat it is known for. Photo insert #4 is of 'Spicebush Swallowtail' stopping by for a visit with L. michauxii in habitat. Photo copyright Katie Hanson-Dorr, all rights reserved. Used with permission.